We are located on the Corner of Coliseum Blvd and Speedway Drive. Next time you, your family, or friends are looking for a great place to eat out, come see us at BJ's Restaurant & Brewhouse in Fort Wayne, IN. We offer a warm and inviting atmosphere with some of the friendliest service in the restaurant business. BJ's Restaurant & Brewhouse started by earning a reputation for hand-pressed deep-dish pizza dough filled with the finest fresh ingredients back in 1978. Today, our dedication to top quality, outstanding service, and our communities has made us a favorite place to eat out across the country. 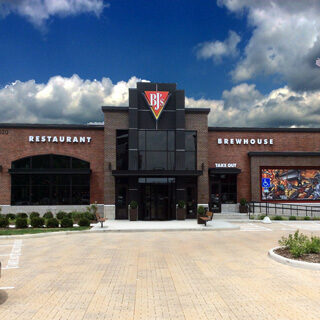 When it's restaurant pizza you're looking for, BJ's Restaurant & Brewhouse in Fort Wayne, IN is a must-visit. Our Signature Deep Dish Pizza is always a favorite with its Southern California twist on the famed Chicago style. Our Tavern-Cut pizzas often have guests coming back for more, and we also offer a variety of gluten-free options. While you wait for this renowned pizza to arrive, consider one of our shareable appetizers. If you're looking for a beverage other than one of BJ's Handcrafted Beers, try one of BJ's Handcrafted Draft Sodas. Chicago Style Pizza with a Southern California twist may be what put BJ's Restaurant & Brewhouse on the map, but you'll find so much more when you stop by for a good meal. Our handcrafted burgers come with a wide range of options, and our Enlightened Favorites are great for a lighter meal. Don't forget to leave room for dessert. Our famous Pizookie® desserts are available in a variety of flavors and combinations that might make it difficult to choose. If you're looking for just the right dish to bring to the next get together of family and friends, check out our Pans To Go. We would also be honored to cater your next event. It's been over 20 years since BJ's Restaurant & Brewhouse started crafting exceptional beers. Today, we have six breweries throughout five states to ensure you can always enjoy a fresh and tasty beer. Every year, BJ's Handcrafted Beer earns prestigious awards in national and international competitions. Check out The Brewers Blog to hear from our renowned brewers themselves. Along with eleven signature beers and cider on tap, we also offer more than ten rotating seasonal beers throughout the year. At BJ's Restaurant & Brewhouse, we've come from a humble pizza shop in Southern California to one of the industry's most loved and trusted restaurants because we've put dedication to our customers and quality at the center of all that we do. When you're looking for a good restaurant in the Fort Wayne, IN area, we think you'll agree that there's no place better than BJ's Restaurant & Brewhouse at 245 W Coliseum Blvd Fort Wayne, IN 46825. You'll find the game on, friendly staff, a full bar, and food that will have you planning your next trip the moment you walk out the door. We look forward to meeting you at BJ's Restaurant & Brewhouse in Fort Wayne. We are excited to be a part of this community! We hope you come in for good food, good beer, and good times!